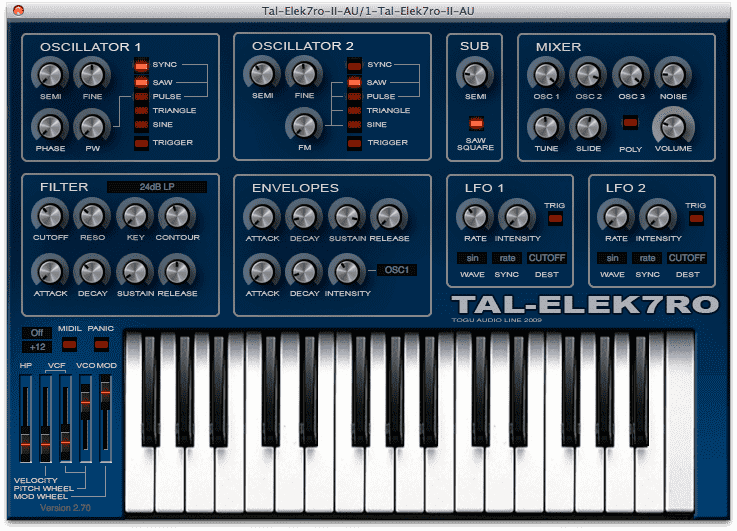 Like U-He, TAL has many freebees for Mac OS X.
I have selected Noize M4k3r and Elek7tro but you also have other interesting plugins. 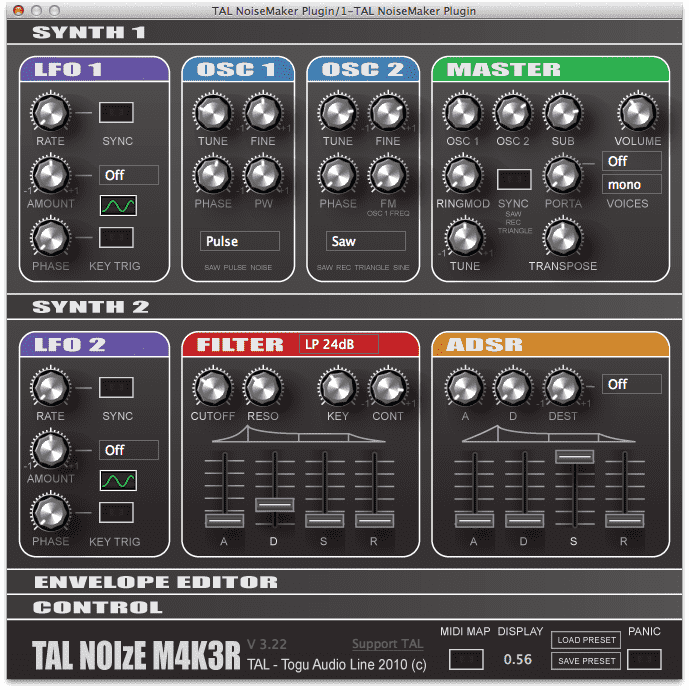 The “Noise Maker” plugin has two osc + sub, a good filter and the famous Chorus “a la Roland”, so you have all you need for your fat bass/lead. Certainly more agressive than Crystal, it completes well the sonic arsenal. The famous free Yamaha DX7 emulation ! It’s VST only (no AU for the moment). Use the cart / load / save button to browse or import presets. It can read / write sysex files for and from the DX7. Now all your FM needs are fullfilled: you can do pop ballad or Detroit techno, vive la FM ! Now that we have the FM synth, the Pad synth, the Bass synth and Lead capable synths, we need a DRUM synth. The Minispillage plugin has three dedicated algo for bass drum, wood drum and hihat. I tend to prefer “Drumatic” but Drumatic is Windows only. After all these synths, we now need an emulation of our prefered organ : the Farfisa combo organ! ComboF gives you the sound of the Italian electric organ we all love. 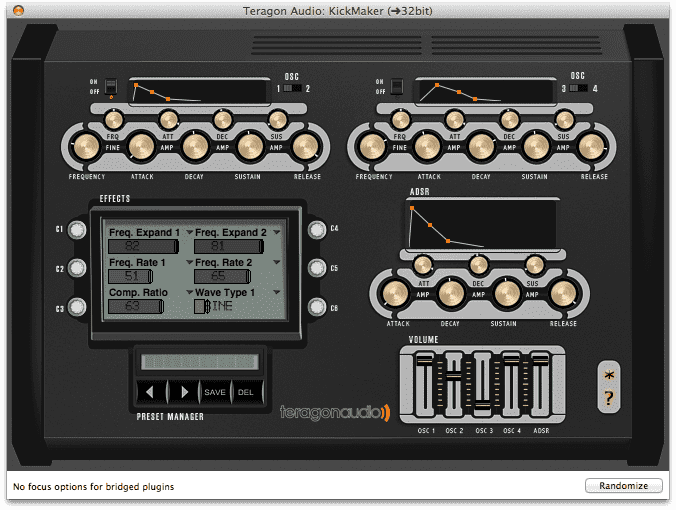 Available for Mac and windows, in AudioUnit and VST! After the organ emulation, we need the electric piano! 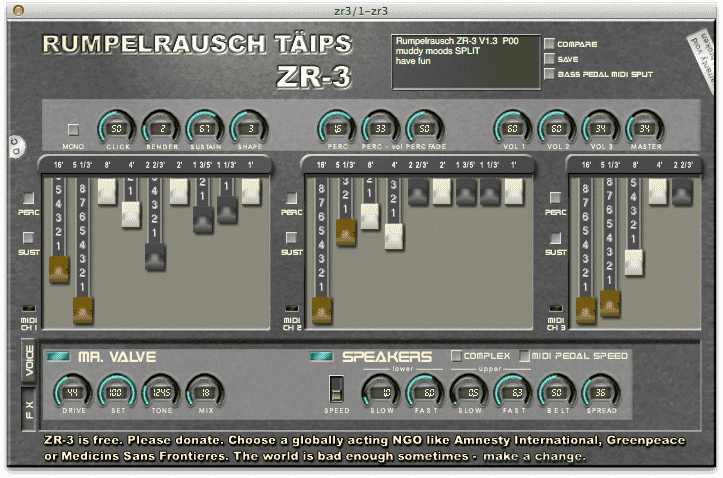 MrTramp 2 is the best (free or not) emulation of the Wurlitzer electric piano. It’s raining again ! Now you can sound like Supertramp ! Breakfast in America !! There are not so much controls but you don’t need more, and the sound is excellent. 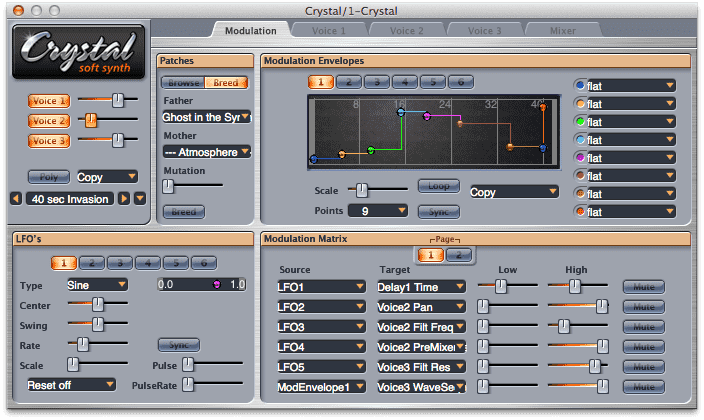 A dedicated string synth plugin for Mac ! 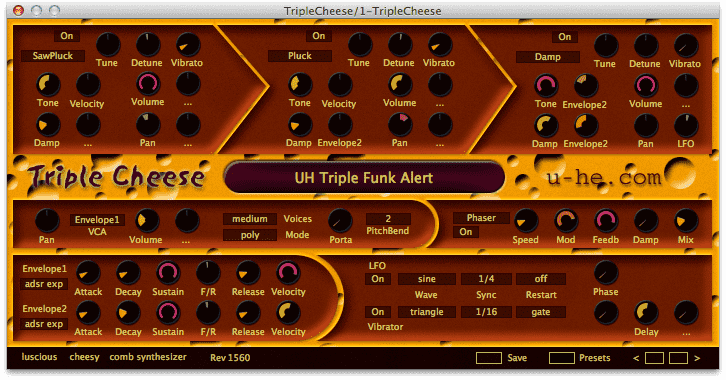 The Cheeze machine from Big Tick is a kind of Arp Solina emulation. It has this phaser / chorus creamy sound. it’s AU only and should work with your favorite Mac host software. The U-He contribution to the first KVR Developer Challenge. It’s an original synth with unusual sound generation. Nice for plucked sounds. Works well on my Mac OS X Mountain Lion. Thanks to the comb filter, you can generate very original sounds. We have ComboF for the Farfisa emulation, and for the Hammond B3 organ lovers, there’s Zr3. It’s VST only and works nice in Ableton Live 9. The only good free Hammond B3 emulation for Mac OS X. 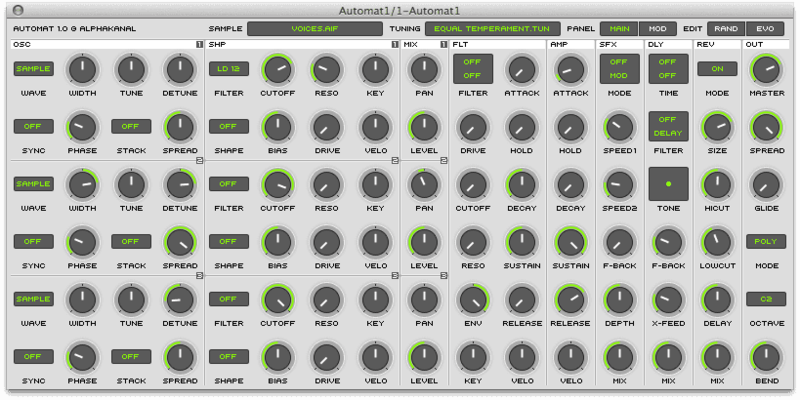 A perfect free synth for bass and perc sounds. Don’t forget to check the other TAL plugins ! Coming from here ! the funkiest text to speech in plugin format ! 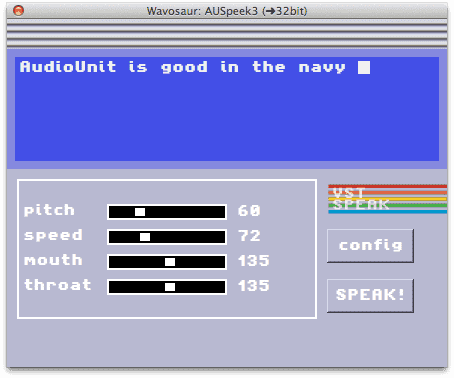 The best C64 Sam oldskool text to speech emulator, for all your techno voices. 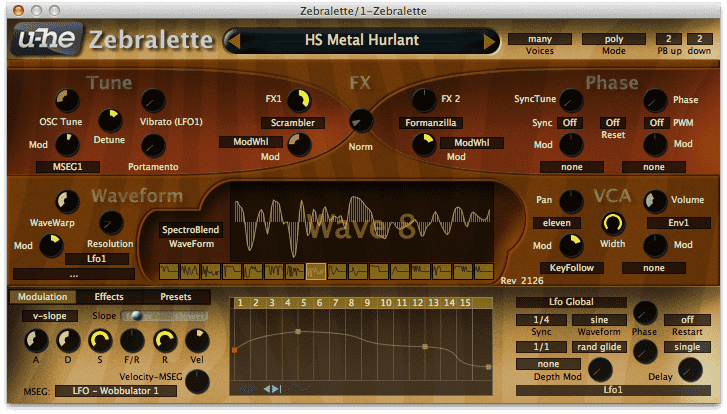 Coming with the demo of Zebra, the famous synth by u-He, Zebralette is a nice synth, with unusual sound, and powerful possibilities and plenty of special waveforms to play with. 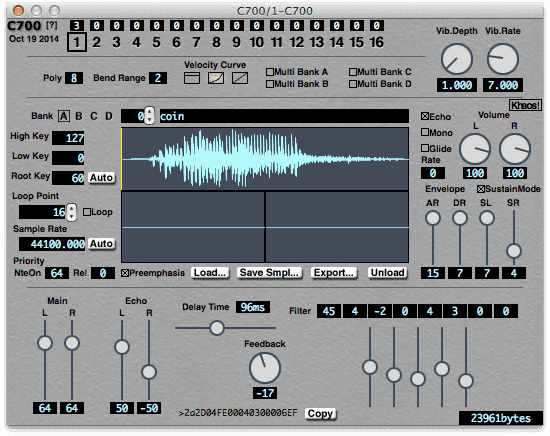 The antic VST from Steinberg, now free, and now available in VST format for Mac OSX. It has been surpassed in all domain by many other synth (freeware included). But it can be useful and you can get some nice sounds out of it if you tweak it with love. 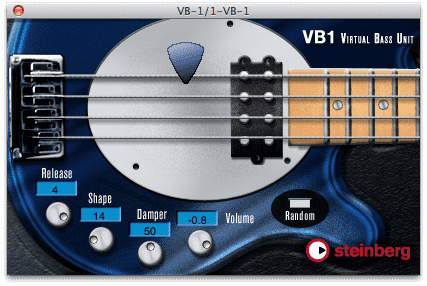 Another prehistoric virtual synth from Steinberg, this virtual bass plugin is free and available with Model E in the same package (see link above). Very simple sound, can be useful. Freeware for Mac are rare so we take it! These free VST work for Mac OS X, they don’t have UI, you’ll have to use the default interface supplied by your host. 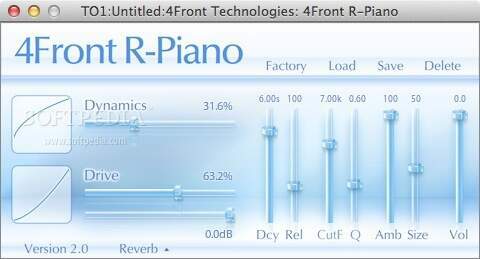 – Piano & ePiano are sample based synth, the ePiano is very good, it’s a kind of Rhodes emulation. – DX10 is a FM Synth, it has only two operators, but you can still get nice bell sounds out of it. – JX10 is a very nice virtual analog synth, despite some bugs (the Windows version has the same), it can do some very nice leads. 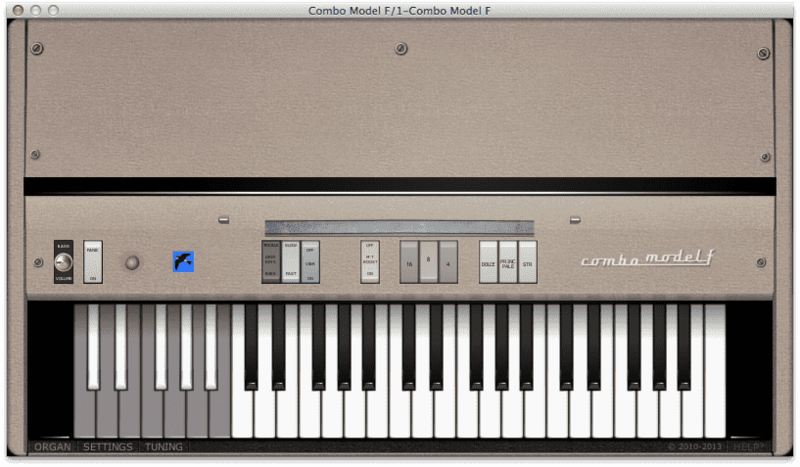 Another free electric piano emulation for your Mac! It’s simple and has a nice clean sound. Perfect for deep house chords. This is the URL where you can also find the Cheeze Machine VST, and also the very good Clavinet emulation by Big Tick (TickyClav). Chip32 is a very simple plugin, perfect for your chip tune needs. A free Audio Unit / VST emulation of an acoustic guitar ! It’s use a physical modelled synthesis, and is a great emulation. Here are coming the ukulele / banjo / Flamenco guitar ! 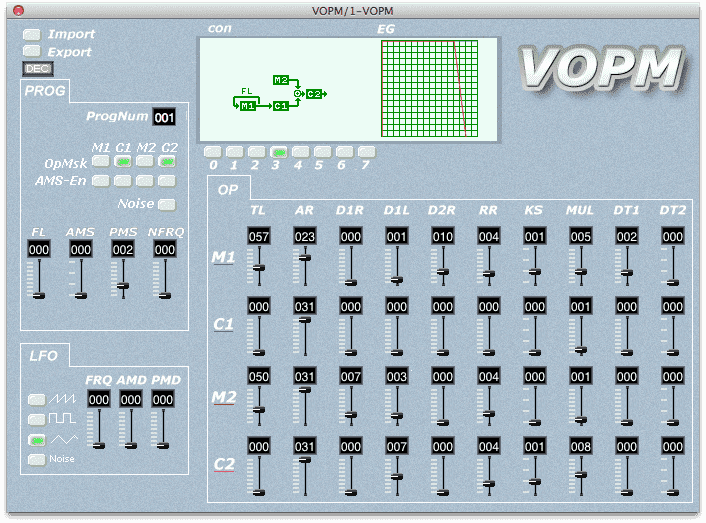 A very simple VA Synth (VST only), with two oscillators, a filter, modulation envelope & some embedded effects : bitcrusher / phaser / chorus / delay. You can also generate random presets! 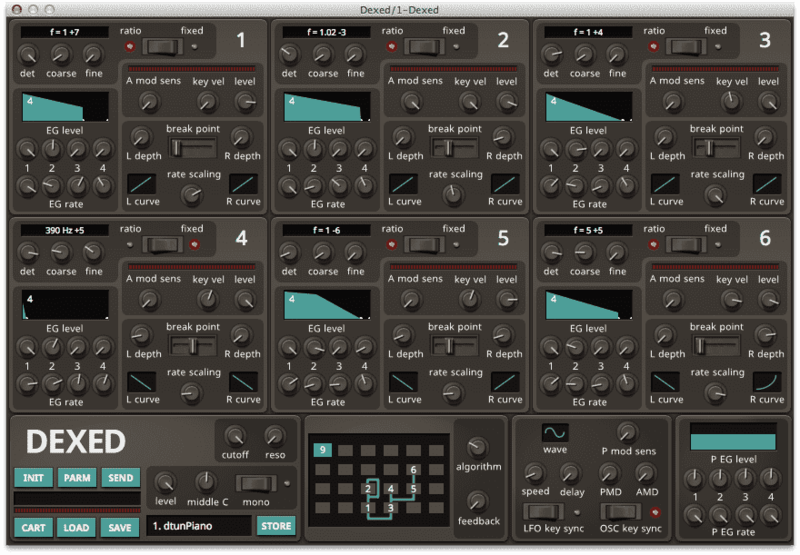 A virtual substractive synth with 3 osc, and filter for each osc, + many effects and modulations. 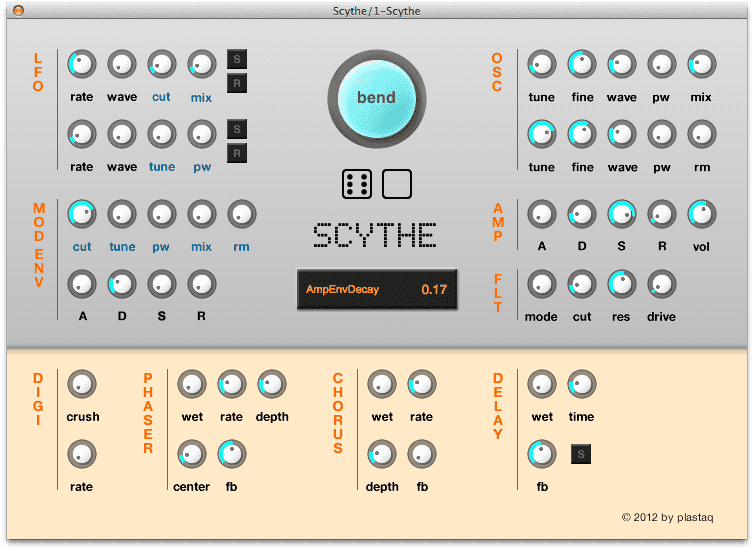 It’s audiounit only, and like Scythe, it has a random preset generator. A VST emulation of the Yamaha YM2151 Chip that was used in many arcade games, and is similar to the chip in the Sega Megadrive. It’s a 4 operator FM synth, with 8 algorithm. 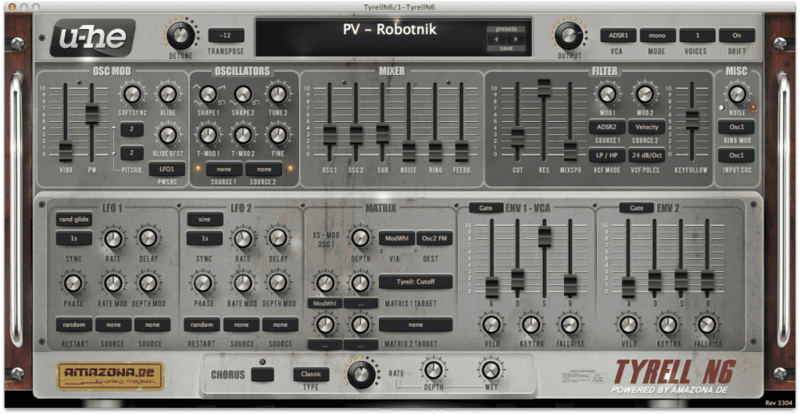 2) I also tried other free VST plugins for MAC , but with no luck (no one working in any host on my Mac OS X Mountain Lion), i think these are too old plugins, or maybe ppc plugins (even if they were said to work on Mac OS X). 4) i’ll do another posts with the free effect plugins for MAC ! It seems there are more effects available for free than synths. yes the ComboV is nice too ! i have tested it too, it works well on all host, i haven’t included it as it seems the developer have removed it from his website. It seems the Sika freeware needs pluggo runtime (i avoid it on Windows, don’t know if it’s more stable on Mac). and these are good suggestions ! 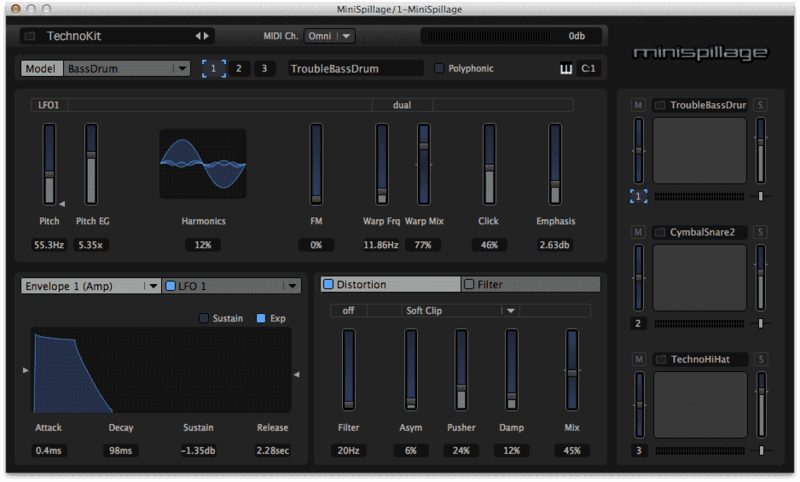 Analog Kick & Analog Snare rompler plugins for Mac OSX. Anyone know about Synth1 on Yosemite 10.10.2? I have installed correctly, no luck at all. I think its Mac days are over. The same problem here. Synth1 is not appearing in ableton plugins. Do you know any solution? there is only terminal appearing in my mac and nothing happens. What should I do? what plugin are you talking about ? Actually I donno how to install these programs. I went to the Helm synth site and tried downloading the Helm synth without making a donation. the file I was offered was full of MALWARE! i downloaded helm synth and everything is fine, no malware. And there is the great Hartmann Neuron , a rework of the original famous Hartmann Neuron, which was then sold as a Windows Vst Plugin. The 64 bit version of Synth1 is very buggy. For example: the 12 dB low-pass filter doesn’t work. Automat is 32 bit only. 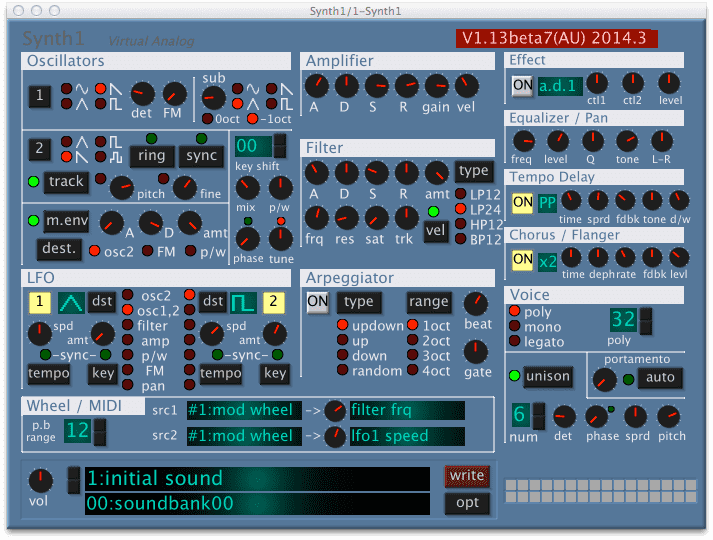 Meant the 64 bit AU version of Synth1.